Watching the Royal Ballet’s Sleeping Beauty, with costumes by Oliver Messel and Peter Farmer and sets by Christopher Carr, is like savoring a sumptuous strawberry-and-cream gâteaux and being transported to an 18th century Neverland to enjoy a work that is immensely rich in variations, styles and – especially in this version – childlike imagination. 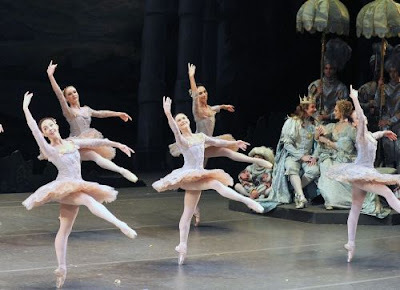 As a whole, The Royal Ballet’s Sleeping Beauty is a relic, a real fairy tale full of mythical beings, famous characters and sumptuous antique costumes, together with traditional cardboard scenery, which by the end of the performance, becomes somewhat cloying. 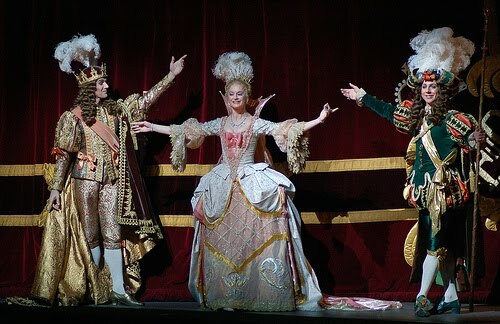 The overall style of the Royal Ballet’s production is ornate and rococo. Excess prevails. While the “Messel style” is luxurious, imaginative, refined and elegant, a little goes a long way and this staging runs the risk of turning the ballet into a children’s fairy tale. The sheer number of artists on stage is staggering. The huge corps de ballet has the pure Petipa style down to a tee in each variation, waltz, entrance and exit. A quality performance is 100% guaranteed. Each dancer is exactly where they should be - allowing the story’s lead characters – of which there are several –to shine. At times, during the prologue, the magic is lost as no distinction is made between the magical beings and the flesh-and-blood characters. The Royal family, palace fairies and guests at the christening are all much the same. In this mish-mash the spell is lost. Tamara Rojo, as Aurora, and Rupert Pennefather, as Prince Florimund, closed the Barcelona run of the English company founded by Dame Ninette de Valois in 1931. Rojo had the Liceu audience at her feet, receiving lengthy ovations for each of her appearances. While she received the audience’s applause graciously, she is a haughty and aloof seductress who gives nothing of herself. She is generous with technique but sparing with emotion. Rojo’s variations were wonderfully plastic and executed with perfect skill. This dancer is blessed with highly arched, flexible feet, and when dancing in the second act, seems to float above the music. Her movement is clear, elegant and smooth but her interpretation showed no character development. Her Aurora was never a wondrous child on the threshold of womanhood but from the beginning was an emotionally-distant adult. Rojo is a powerhouse of technique and can turn like a top, tossing of six pirouettes in her first-act solo variation. She could hold a balance until the orchestra fainted if she liked, as she has shown in other ballets. She can remain on balance, whether en attitude or arabesque, until the end of the musical phrase and, when this is about to die out, finish simultaneously with the sustained crescendo of the orchestra, triumphantly ending her variation –in this case, the famously difficult “Rose Adagio”. This is what we experienced on the night of Tuesday 13 at the Liceu — Rojo went one step further than Petipa in the final part of the Rose Adagio and demonstrated her ability, in best “Rojo style”, for pure exhibitionism, which whipped the audience into a furore. Knowing that these displays of bravura are one of her strengths, Rojo exploited them over and over again, emerging victorious at each demonstration of skill and acrobatics. Beside her, Pennefather was a courteous and elegant Prince. His two variations revealed a highly artistic, meticulous and elegant technique and his style is identifiably British. While Florimund is hardly one of the most complex or colourful men in ballet, even in this role the elegant Pennefather was a little too restrained. The sweetest character in the story, the Lilac Fairy, was delightfully danced by Claire Calvert, whose incredible legs match those of Darcey Bussell. Along with a stunning physique and slender figure that stood out among the other fairies —she oozed sweetness all night— she generally showed a clear style, although her solo during the prologue was a mite fudged. The virtuoso main course of the evening was the much anticipated Blue Bird pas de deux danced by Steven McRae and Laura Morera who suffused the stage with a rush of adrenaline. McRae is an extraordinary and highly versatile dancer and proved to be the most energetic and passionate of the evening. As the Blue Bird, he was superb, flying over the stage, dazzling with his impeccable batterie, and triumphing in the final coda, where the hectic and demanding brisés volé diagonal was flawlessly executed. Morera, meanwhile, brought charm and a delightful ease to Princess Florine. Her dancing was both fluid and clear, with delicious phrasing and pure line. The National Youth Orchestra of Catalonia, passionately directed by the Russian Maestro Valery Ovsyanikov, musical director of the Mariinksy Theatre and the Vaganova Ballet Academy in St. Petersburg, unleashed all their artistic power, beauty, and clarity. Structurally, the story runs smoothly and has a rapid denouement. Carabousse, attractively played by Genesia Rosato, is defeated in the blink of an eye. I personally can’t get the great and terrifying Carabousse out of my head, created and performed by none other than Sir Anthony Dowell in a memorable characterisation and interpretation. Aurora is rescued by Florimund, they celebrate their wedding with a big party and everyone goes on to live happily ever after. The audience, entranced, applauded the British company heartily, including the soloists Rojo, Morera and McRae for several minutes. And then it was all over. At the end of the Liceu Theatre’s 2009-2010 season, the Royal Ballet, with all its strength and power, danced one of its most emblematic ballets, a dream come true for many ballet lovers.